I'd be glad to sign one for you, but you should be aware this is a small paperback, just 102 pages or something like that, and not a "fancy" collectible edition. There were only 50 copies printed which is why it sold out so fast. Not trying to say it's not kind of a cool thing, or that you should not want it... but it might not stack up against some of your finer editions. I love to hear about people who still value and prize fine books! My own book collection is just as important to me as my CD collection. My wife and I have an entire room in our house lined, from floor to ceiling, with bookshelves. I love books, but, frankly, don't read as much as I did pre-kids. But I value our book collection as much as my CD collection. Just finished: Austin Grossman - You. This book seemed to have a lot of potential, but never really went anywhere that seemed compelling. The book is about Russell--a D&D kind of guy in the 1980's who, along with a few friends, developed an important engine for an early RPG computer game. After trying to fit into the mainstream by pursuing a law degree, he bows out and returns to the game studio, Black Arts Games, that his high school friends founded based on the success they experienced with their early titles. The book is largely a "coming of age" story--for someone in his 40's--and many of the issues he struggles with are narrated in the Infocom-style third person format ("You are standing in front of a white house...") as he plays through the games and projects his issues onto the characters. This might have some nostalgic value for people who have fond memories of the early home computer days or who like old-school RPGs. Without that hook, however, the rest of it falls pretty flat. It is still fun, however, if you like to think about computer games. I finished Ancillary Justice by Ann Leckie a few weeks ago but forgot to post anything here. I enjoyed it very much, one of my favorites this year(along with the Sand Omnibus by Hugh Howey.) It's a bit confusing at first, there's no initial explanation about what an ancillary is, the main character uses the pronoun "she" to describe everyone, the story shifts perspectives and time periods and it unfolds slowly. But struggling to figure exactly what is happening is what makes the book so rewarding. About halfway through the book I heard that there will be a second book, Ancillary Sword, so I was worried that Justice would not be satisfying. But it was and that is just one of the reasons it's an excellent read. Poul Anderson - Tau Zero A space ship malfunctions and continues to accelerate indefinitely. Hard SiFi but good human aspects within. Very interesting concepts and stories on an alien world that is being abandoned by human colonists after things start to go wrong. There was a bit in the middle of the book that lost me for a while as it was just a bit too long winded. However overall this is an excellent read with an interesting writing style and I will read it again. I just finished "Cocaine Blues" - Kerry Greenwood. Liked the "Miss Fisher Mysteries" tv show so much thought I'd try the first book ( 99 cents on barnes and noble to get you hooked... seems like the title come to think of it.... here - have a taste ) - so now reading the 2nd. Ancillary Justice seems to be taking the SF world by storm this year. I just returned from ReaderCon, a big science fiction, fantasy and horror convention in Boston, and lots of people were talking about it. I expect I'll read it soon. I listen to this podcast just about every week, and always enjoy Jonathan Strahan and Gary Wolfe's discussions about Science Fiction, Fantasy and Horror fiction and publishing. Maybe it's just because I'm a fiction writer myself, but I always find it interesting to hear a writer talk about where their story came from, how it developed, and all that kind of "behind the scenes" stuff. If you're into SF/F at all, the Coode Street Podcast is a wonderful resource to explore. They do a new one every week. Oh snap. Far From Streets arrived yesterday. Looking forward to reading it. Didn't see this over the weekend, as Lena and I were traveling for our anniversary -- but I'm glad your copy has arrived. Hope you'll enjoy! Recently started reading "The Circle" by Dave Eggers and it´s very promising so far. Probably not a second "1984", but I do like the topic especially in regard to today´s critical issues of collecting personal data. I recently read Suttree for the first time, and loved it. It was great to see McCarthy working in a different mode - funnier and more personal. Still very harsh, though. I'm a bit late to the Dragon Tattoo Party, but my wife read these when they came out and really enjoyed them. After re-watching the David Fincher movie, I was inspired to read the series. Will read the third book next. Some books are more equal than others. A classic and a good re-read, but it always makes me pessimistic about the nature of human and pig affairs. Non-fiction. A book about the kinds of tricks or hacks that people use to obtain personal information (e.g., bank accounts, passwords). The emphasis is on the social or human side of security rather than the tech side of it. Really interesting. 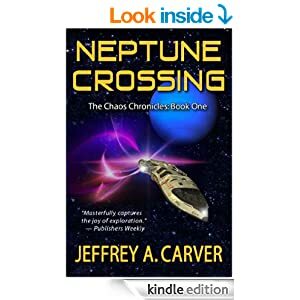 Jeffrey A Carver - The Chaos Chronicles. A human mining operative working on Triton is possessed by an alien being. Said alien wants him to save Earth from a catastrophic event. There is some quite humorous interaction between the two lifeforms. 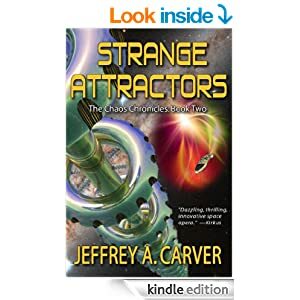 Book 1 very good indeed, the second Strange Attractors - mmmhh not as engaging. Had to get the third book though to find out what happens ( the usual quandary ). It is excellent so far. Just finished Far from Streets. Nice work, Mike! The story is about a couple, Dane and Carolyn, who inherit several acres of property in the wilderness of Oregon, far from civilization. Dane uses this as an opportunity to break free of what he construes as the constraints of modern living, and, over a period of time, builds a cabin on the property where he and Carolyn can escape to on weekends. There is a sense in which they are living off the land, but, on Mondays, they return to their normal life--a life that Carolyn seems to value more than Dane. As the story progresses, however, the new life that Dane has forged becomes increasingly disjointed: it is unclear whether he and Carolyn are alone in the woods, they often feel they are trapped "inside" the wilderness like a bird inside a house, and time itself seems to move in unexpected ways. This is a solid story and a nice debut novella for M. Griffin. Chris23, thanks very much for the feedback. I'm glad you enjoyed the story! Am reading my way through the Hyperion cycle by Dan Simmons. Currently about 100 pages into Endymion. I don't know why it's taken me so long to read this series. It deserves to be mentioned in the same breath as Dune and Foundation.